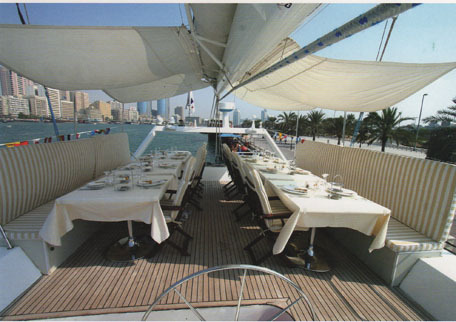 Yacht Charter can be the ultimate in luxury entertainment in Dubai. Charters can be provided with waiters, chef and even a masseur - along with refreshments of your choice. Options of half day or full day, sunrise or sunset cruises are available. Dubai has become one of the hottest sail fishing venues in the world. The exceptional tag and release records are proof of this phenomenon. To see the pods of Sailfish fining out in these calm seas is a thrilling experience. An experienced captain and crew will guide and assist guests in all aspects of fishing and cruising, The Sailfish season runs from late September to the end of April, and other types of game-fishing are also available. Fish that are caught include Queen Fish, Barracuda, Kingfish (Spanish mackerel), Cobia, Trevally, Dorado and Bonito. Yachts, boats and other equipment are all fully insured and transportation is offered for guests to and from anywhere in Dubai. Safety lockers are available for luggage as well as refreshments and beach chairs for relaxation.